A dental filling is a dental restoration fabricated to restore the function, anatomy and integrity of teeth that have been damaged by trauma or dental caries, also known as dental cavities or dental decay. There are 2 types of restorations: Direct and Indirect. 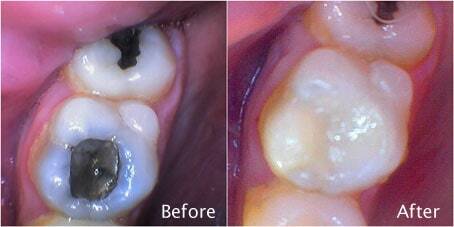 Are dental fillings made outside of your mouth, usually in a dental laboratory, and cemented into your tooth. * Limits damage caused by trauma and dental cavities, dental caries or dental decay. * Protects the remaining tooth structure from further damage. * Reestablishes adequate function of the tooth. * Helps prevent damage to the nerve of the tooth. * Helps prevent tooth loss. * Makes it easier to clean your teeth. * Lowers the bacterial count in your mouth. * Helps you achieve and maintain fresh breath. When is the best time to obtain Dental Filling? * A greater amount of healthy tooth structure is retained. * The teeth are stronger because there is a greater ratio of strong tooth structure to dental filling material. * Treatment is less complex and therefore of shorter duration. * Treatment in early stages is often less expensive. * Treatment is usually accomplished with more comfort with less post-operative sensitivity.